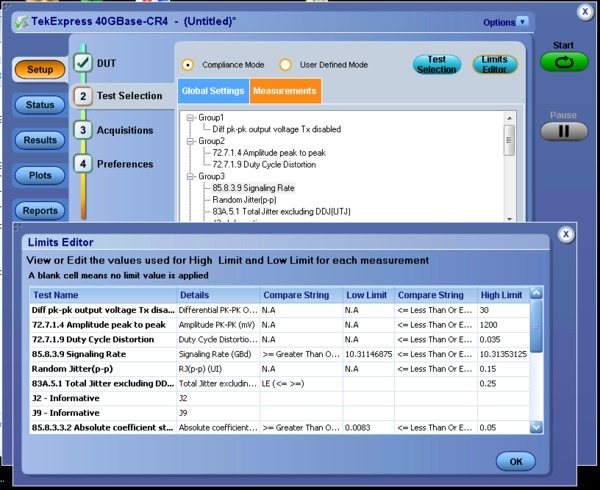 The Tektronix TekExpress® 40GBase-CR4 Debug and Automated Compliance Solution application (Option 40G-CR4) provides design engineers with an easy-to-use automated solution to test and debug 40GBASE-CR4 designs, using off-the-shelf tools, to reduce human-related measurement errors and shorten the design cycle. The 40G-CR4 solution provides measurements for electrical characterization of 40GBASE-CR4 signal at TP2 and TP0. Clause 85 of IEEE 802.3 specification details out 40GBASE-CR4 PMD. The 40GBASE-CR4 is a 40 Gigabit Ethernet technology with a low-swing AC-coupled differential interface. AC coupling at the receiver allows for communication between components operating from different supply voltages. Low-swing differential signaling provides more noise immunity and improved electromagnetic interference (EMI) protection. The 40GBASE-CR4 signal paths are point-to-point connections, with four differential paths in each direction for a total of eight pairs, or sixteen connections. It uses 4 lanes of shielded, balanced copper cabling between the transmitter and receiver to achieve the required data rate (4 * 10.3125 Gbps). 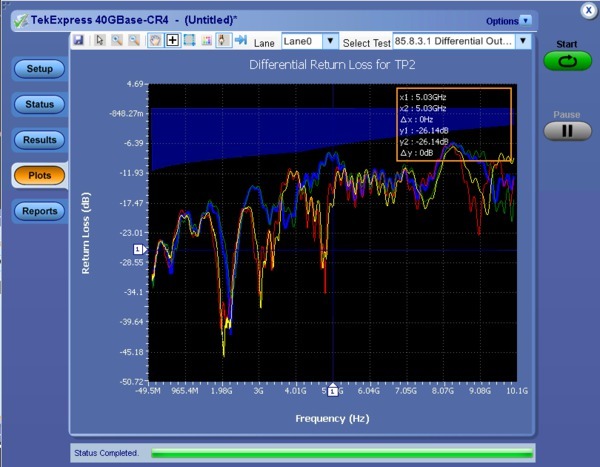 The length of the signal path in 40GBASE-CR4 can range from 0.5 m to 7 m.
To take measurements of the signal at TP0, engineers will acquire the signal at TP2 and use filter files to de-embed the channel effects between TP2 and TP0. This filter need to be an FIR filter, a .flt file with filter taps stored in the Tektronix FIR Filter file format. 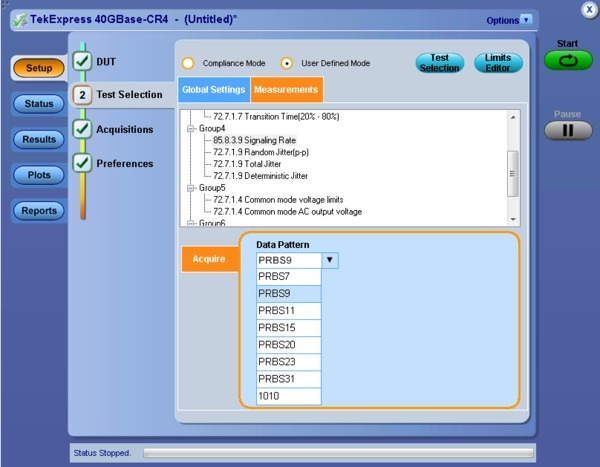 The new 40G-CR4 solution lets you easily select and run measurements for 40GBASE-CR4 testing. Simple and easy-to-use measurement setup helps customers perform all measurements with a single button click. Automation options help customers meet their compliance needs and generate detailed reports. A user-defined mode lets customers make changes to the test limits and perform margin testing beyond compliance. 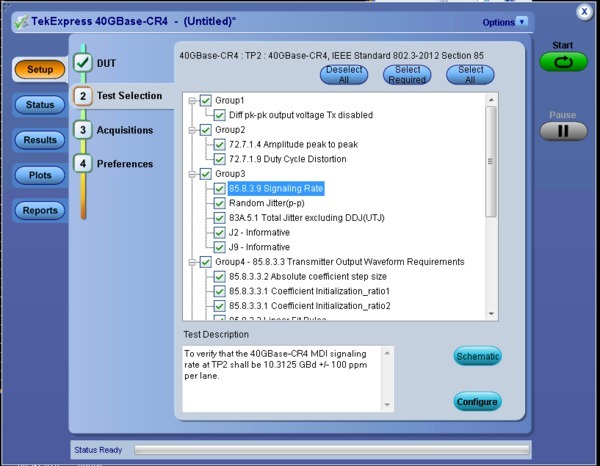 The new 40G-CR4 solution helps customers to easily select measurements for 40GBASE-CR4 testing. All masks, limits, and measurement parameters are automatically configured for the customer. Additionally, customers have the flexibility to change selected measurements and measurement configurations within DPOJET. 40G-CR4 DPOJET options provide a new standard-specific UI. 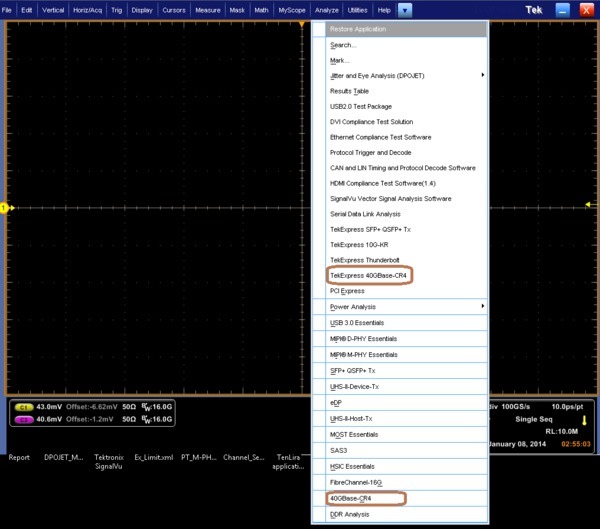 Signal-specific setup files let design engineers perform measurements on different signal types, letting the engineer go into Analysis and Debug modes. Measurement setup and test execution is simple with the 40G-CR4 software. The oscilloscope signal acquisition and measurement analysis are all controlled through the 40G-CR4 automation solution. The Graphical User Interface (GUI) provides an intuitive workflow for measurement setup, testing, and reporting. 40G-CR4 supports design characterization beyond IEEE 802.3-2012 compliance requirements for all measurements. Qualify PHY with flexible control over test configurations such as analysis windows and other parameters. A user-defined mode lets customers make changes to the test limits and perform marginal testing beyond compliance. Additional informative measurements have been added to compliance suit which provide design engineers with greater insight into their designs. Additional measurements include Total Jitter, Deterministic Jitter, J2, J9 and Transition Time. As data rates increase, high-speed serial technologies have introduced new test methodologies and requirements for compliance testing. 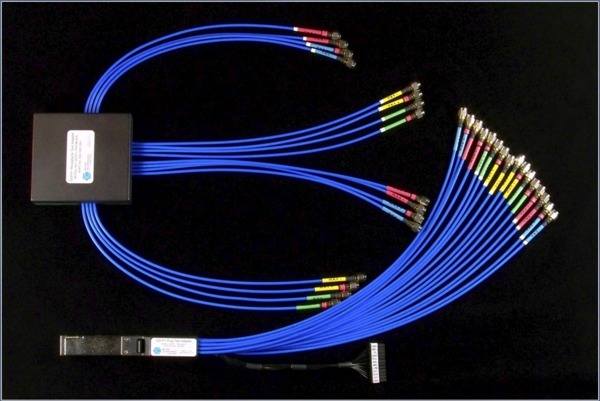 As technologies such as 40G increase in data rates, the eye is closed and different components such as SMA cables can be de-embedded to get better results. 40G-CR4 provides an option to de-embed the signal using .FLT files. The Tektronix 40G-CR4 solution does not provide an ability to perform Differential Output Return Loss or Common Mode Output Return Loss. 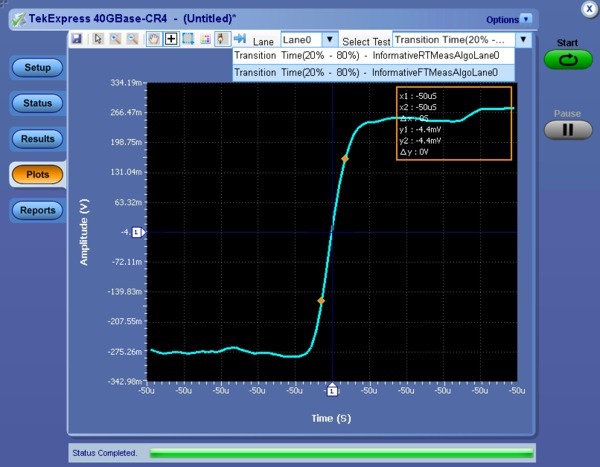 The 40G-CR4 solution does provide the ability to take an .s16p file as an input to map the results against limits. This feature provides design engineers an option to use common reporting and plotting mechanism available on one instrument. Users are prompted to provide a path to the .s16p file when they click the Configure button. 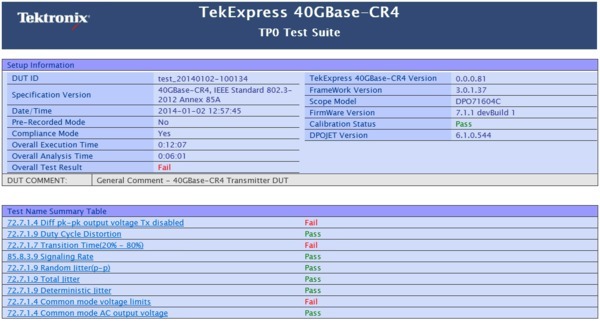 Option 40G-CR4 is equipped with the latest TekExpress interactive plot module. This feature lets you take a look at the signal after a test is performed. With this new plot module, you can move the cursors and find out the delta on the X and Y axis. The report configuration menu lets users configure reports, and it provides options such as auto increment, appending, and so on. Many products available on the market support patterns over and above what is specified in IEEE 802.3. 40G-CR4 provides multiple patterns in user defined mode to extend testing beyond the IEEE 802.3 requirements. User defined mode supports PRBS7, PRBS11, PRBS15, PRBS20, PRBS23, and PRBS31. 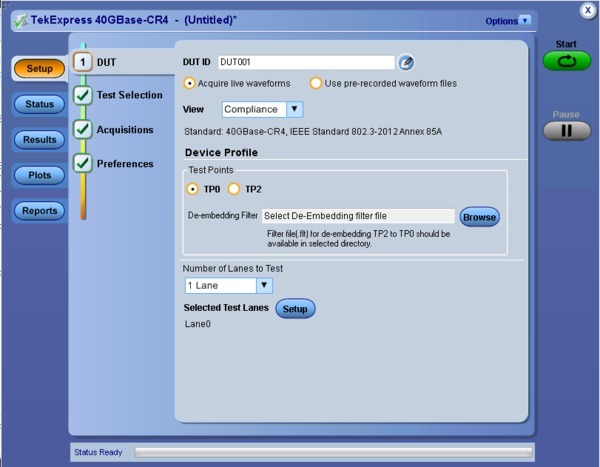 40G-CR4 also provides patterns to support compliance testing, including PRBS9 and 8180. A summary report in .MHT (MHTML) & .PDF format with Pass/Fail status is automatically generated after tests complete. The report includes test configuration details, waveform plots, and margin analysis to provide more insight into your design. QSFP+ Host- QSFP+ Host Compliance Board Plug and MCB- QSFP+ Module Compliance Board Receptacle is available from Tektronix. Wilder Technologies manufacture these fixtures however interested users can buy it directly from Tektronix. 40G-CR4 solution will support only single ended input. Differential probes are not supported. Use TCA-292MM when the application is run on oscilloscopes with a bandwidth greater than or equal to 25 GHz. Use TCA-SMA when the application is run on oscilloscopes with a bandwidth less than 25 GHz. 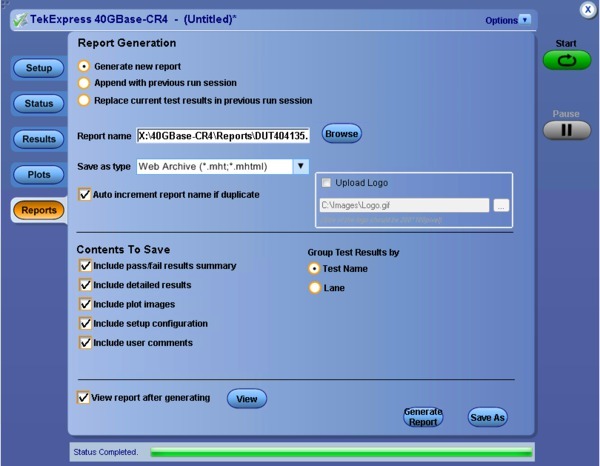 40GBASE-CR4 Debug and Automated Compliance Solution. 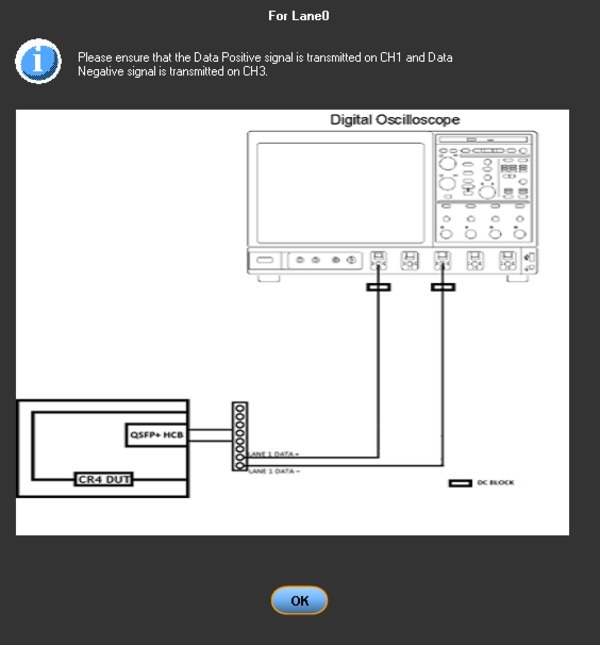 Order Option 40G-CR4 to preinstall the software on a new Tektronix DPO/DSA/MSO70000 series oscilloscope. 1 Required to run 40G-CR4. The QSFP+ Host- QSFP+ Host Compliance Board Plug and MCB- QSFP+ Module Compliance Board Receptacle is available from Tektronix. All of these fixtures are available from Wilder Technologies. The 40G-CR4 software is warranted for 90 days.